Accept being a capable off roader this vehicle also comes with great deal of luxury inside and out. Although in last decades this vehicle is driven more by soccer moms than Indiana Jones enthusiasts, it still comes with a great power and torque to match. This is Toyota’s longest running series of vehicles and by far the most popular four wheel drive luxury SUV on the planet. 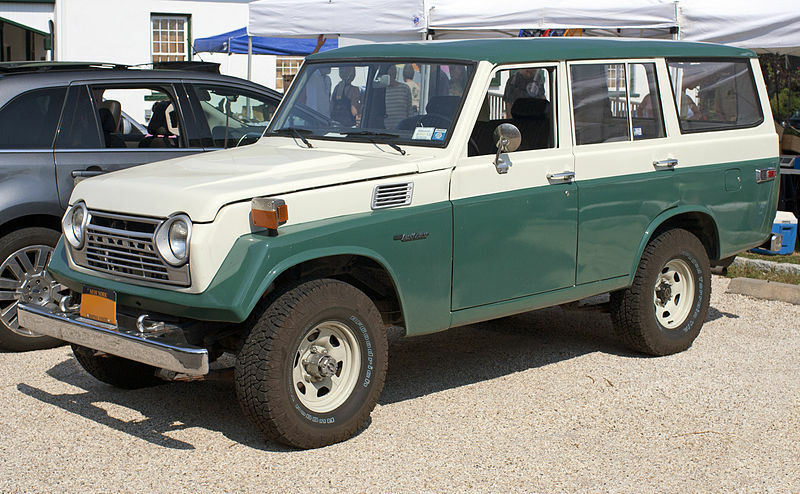 This vehicle’s origins are deeply rooted in Japan’s post war history and first models look lot like the American army Jeeps used in Korean war. This look was nourished until the first comfort oriented versions start rolling down the assembly line in 1967. These models saw generation change in every 10 years approximately, with the last generation being J200 series that was released in 2007 and is still rolling. On the outside this vehicle looks more bulky than any other vehicle from Toyota line up, accept maybe Toyota Sequoia. Its exterior shares some influences with most of the trucks from Toyota line up. Front part has a bigger and flashier grille than some previous models, and it comes with full LED headlights. On the outside Land Cruiser looks a lot a like Lexus LX 570. On the inside it also shares a lot of features with Lexus LX, which makes this vehicle more luxurious than similar SUVs. Dashboard comes with shinier metallic trim around some of its elements and a more glossy woodgrain trim. Interior is dressed in new perforated leather upholstery and central console is little bit over packed with climate, audio and off road controls. 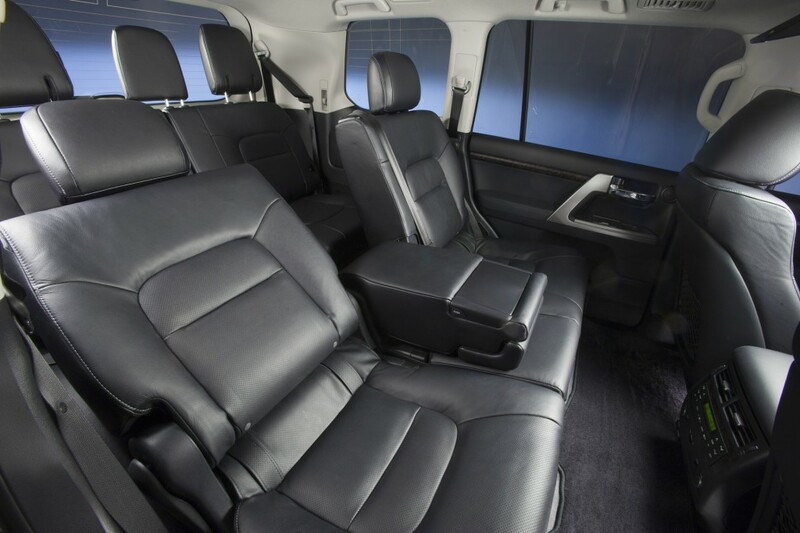 This SUV comes with very comfortable seats, although it’s not much different than the interior comfort of Toyota Highlander that costs half the price of Land Cruiser. Second row of seats come with sliding mechanism that gives little bit more space to the third row that feels totally cramped, especially during longer rides. Second row gives plenty of leg and head room, and the mentioned mechanism adds up few square inches on top of that. Third row bench seat can’t be folded to the ground, It can only move sideways, which increases trunk area, but offers much narrower space than if third row had folding mechanism that goes all the way to the ground. One of the main reasons for high price of this vehicle is great pack of equipment that comes with it. This is the field where Toyota rules, and the Land Cruiser has all the goodies. There are no additional options, everything is offered with the standard version. From moonroof, leather upholstery, heated seats, four zone climate control, heated steering wheel wrapped in leather, DVD entertainment system, cruising control. 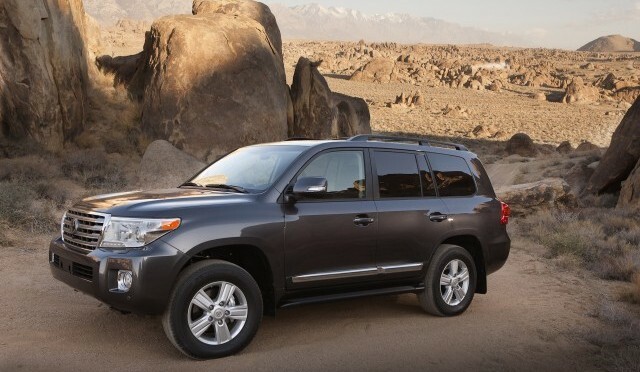 There’s only one engine option that comes with 2015 Toyota Land Cruiser. Same engine we’ve seen in the last years model and it’s the 5,7 liter big V8, that produces 381 horsepower and 401 pound feet of torque output. Vehicle comes with mighty off road package, with Hill Descent Control, Trailer Sway Control, Hill Start Assist, CRAWL Control and Off-Road Turn Assist. It can pull up to 6,000 pounds, which not much, but it is the consequence of Land Cruiser’s heavy construction. This vehicle is one of the more expensive ones in its class, that’s of course if we don’t count it as a luxury SUV. There’s only one trim level, and no additional options. It can be bought for $79,905. Some of the larger SUVs that can be compared with this vehicle are Honda Pilot, GMC Yukon XL and Jeep Grand Cherokee. Nationwide insurance rate for Land Cruiser would be around $1,300, depending on the year of production and age of the driver. These rates can go much higher in states like Michigan or California, close to average in Texas and much lower in Ohio which is the least expensive state when it comes to car insurance. On this page you can find Land Cruiser’s owner manuals for vehicles produced between 1990 and 2007 model years. 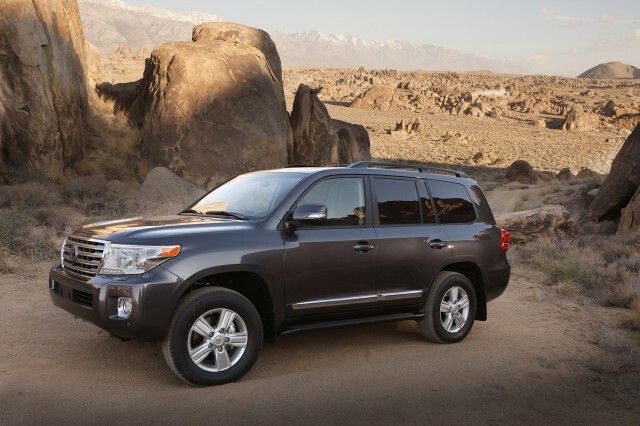 Toyota Land Cruiser is one of the characters of Transformers 4. Other than that this SUV didn’t have any major movie appearances. It is a popular celebrity SUV, Some of the famous people who drive it are: Reese Witherspoon and 50 Cent who doesn’t drive it anymore, but it was his first car he bought after he became famous. What Girls Think About Toyota Land Cruiser?